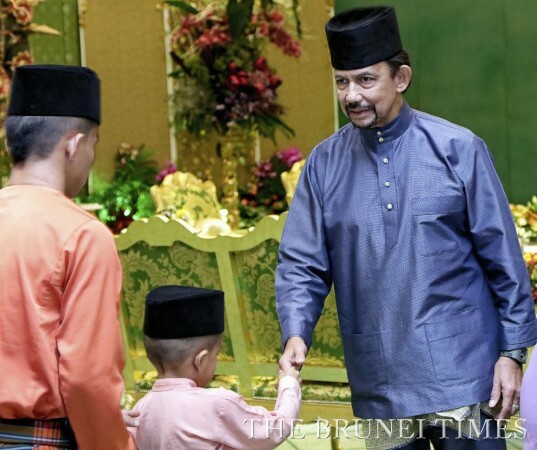 SWELTERING heat did not diminish the festive spirit of thousands of well-wishers at Istana Nurul Iman during the last day of the royal family’s annual Hari Raya meet and greet, which saw more than 100,000 visitors descend on the palace. Some 39,943 people made their way to the palace on the final day of the open house, bringing the three-day total to 109,642. This year’s number is the second highest that was ever recorded. The highest volume of visitors was recorded in 2012, when 110,728 people visited the palace.Dressed in their finest attire, visitors queued for hours for the rare opportunity to meet the monarch and other royal family members. The day was divided into morning and afternoon sessions, each lasting about two hours. Receiving male guests in the Baitul Rahmah Hall were His Majesty Sultan Haji Hassanal Bolkiah Mu’izzaddin Waddaulah, the Sultan and Yang Di-Pertuan of Brunei Darussalam; HRH Prince Hj Al-Muhtadee Billah, the Crown Prince and Senior Minister at the Prime Minister’s Office; HRH Prince Mohamed Bolkiah, Minister of Foreign Affairs and Trade; HRH Prince Hj Jefri Bolkiah; HRH Prince Hj Sufri Bolkiah; HRH Prince ‘Abdul Malik; HRH Prince ‘Abdul Mateen; and HRH Prince ‘Abdul Wakeel. 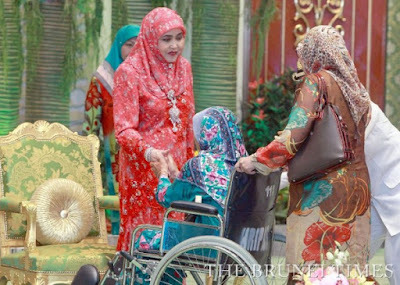 In an adjoining room, Her Majesty Duli Raja Isteri Pengiran Anak Hjh Saleha received the female guests, accompanied by HRH Pengiran Anak Isteri Pengiran Anak Hjh Zariah; YAM Pengiran Bini Hjh Faizah; HRH Princess Hjh Rashidah Sa’adatul Bolkiah; HRH Princess Hjh Muta-Wakkilah Hayatul Bolkiah; HRH Princess Hjh Majeedah Nuurul Bolkiah; HRH Princess Hjh Hafizah Sururul Bolkiah; HRH Princess ‘Azemah Ni’matul Bolkiah; HRH Princess Ameerah Wardatul Bolkiah and HRH Princess Hjh Amal Umi Kalthum Al-Islam. People from all walks of life were among the visitors yesterday, including grassroots leaders, officers from the Ministry of Home Affairs, new converts, senior citizens groups, special needs groups, as well as members of the business community. 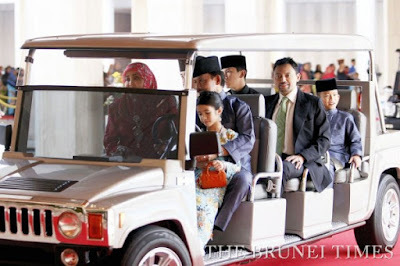 Guests were served with a wide selection of food upon arrival at the Istana before queuing up to meet the royal family. As a token of appreciation, visitors were given embossed yellow boxes containing traditional Hari Raya cakes. Former Brunei Barracudas forward Michael Pilgrim was among the visitors yesterday. 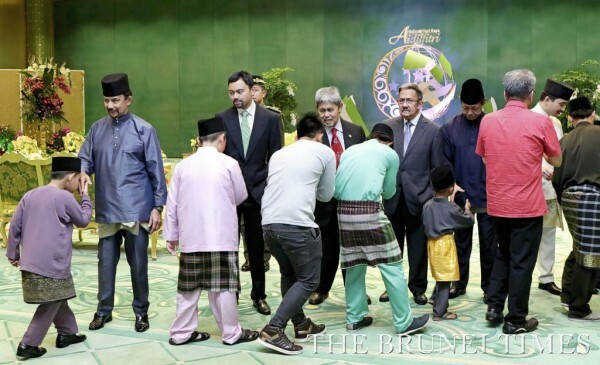 “This is my first time visiting the palace during Hari Raya, I never had the chance when I was playing in Brunei before so it is definitely a unique experience,” he said. Pilgrim is back in Brunei to play for Easyway basketball team in the upcoming Mum Bakery Cup on July 25, held in conjunction with His Majesty’s birthday. Easyway team manager Wira Pori said it had become a team tradition to bring the players to the Istana each year for the annual Hari Raya meet and greet. 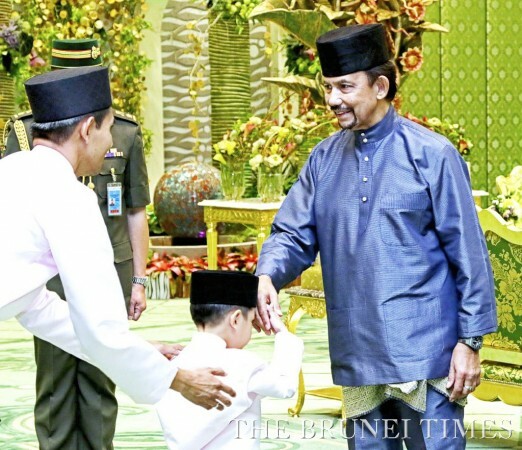 The annual open house at Istana Nurul Iman is one of the much-anticipated highlights of the festive season and is attended by thousands of Bruneians, foreigners and tourists each year. Last year, 96,555 people visited the palace while 105,786 visitors was recorded in 2013.